It's time to challenge - the terrific waves! 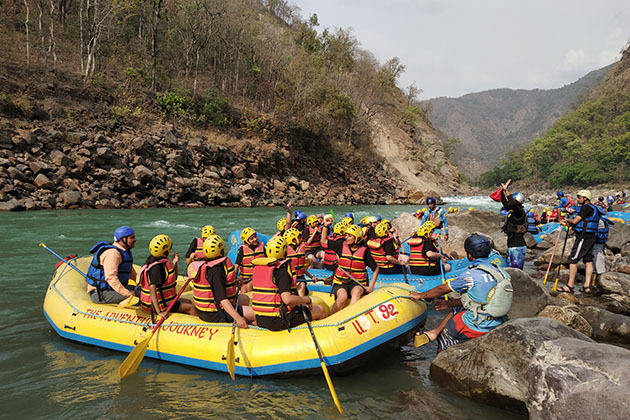 Rishikesh is one of the ideal destinations of all adventure extremist and rafting all along the mighty Ganges is every adventure seekers dream come true. You do not have to know about swimming, and even white water rafting expertise is not essential. 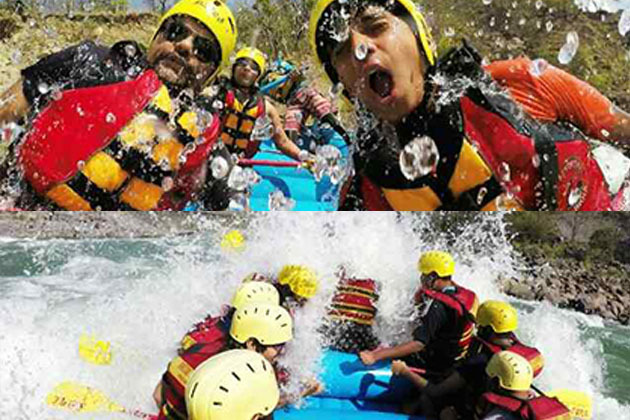 Rafting in Rishikesh is for the adventurous! It's for you if you have the wish to stop thinking about the city's traffic and the concrete jungle and would like to feel the happiness of plunging down icy cold glacial waters of the majestic Ganges just 36 km from Rishikesh and at an elevation of about 390 meters at a place called Kaudiyala that is bounded by dense and broad forests. These forests are the natural habitat for exotic wildlife. 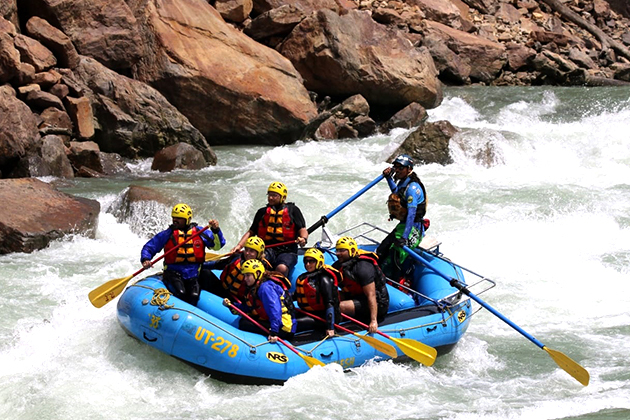 It also provides the backdrop for your experience of river rafting in Rishikesh. The experience is definitely a breathtaking one since the river is turbulent and icy just as the mountains all around are rugged and daunting. You are secure since you would be wearing a helmet and life jacket to defend you in case of a most uncommon spill. Your raft and all the accessories are imported and the best in quality for your protection. So, you must go for this great experience near Rishikesh or in that other one that is Kali River Rafting. 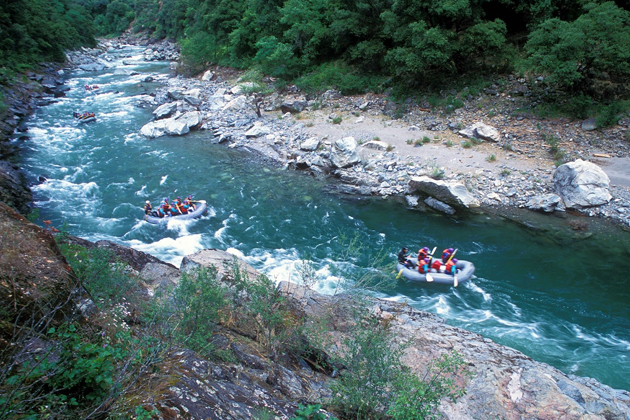 Particularly for white water rafting, Rishikesh has become most popular worldwide. While providing the same thrill and excitement, rafting will not be that dangerous and hazardous, as in the case of rivers in Africa, Sweden or USA. The reason is rafting is facilitated in The River Ganges, which is flowing along the rocks very smoothly. You only need basic level paddling experience, to enjoy rafting here. Completely safe rapids are provided for your use and you have very wide choices to choose from, in respect of rafting distances – long or short. Include: Body Surfing & Cliff Jump Helmets & river rafting gears other required safety accessories rafting transport. Rapids: Return to Sender, Roller Coaster, Golf Course, Club house, Initiation, Double Trouble and Hilton. Trip Info: We tackle Return to Sender, Roller Coaster, Golf Course, Club house, Initiation, Double and Trouble. One can try Body Surfing and Cliff Jumping also in this section. We float past temples and ashrams and Ghats, enjoying the riverbank life along the Ganga. Arrive in NIM Beach. Rapids: Three Blind Mice, Roller Coaster, Golf Course, Club house, Initiation, Double Trouble, Hilton. Trip Info: We tackle Return to , Three Blind Mice, Roller Coaster, Golf Course, Club house, Initiation, Double Trouble, and Hilton. One can try Body Surfing and Cliff Jumping also in this section. We float past temples and ashrams and Ghats, enjoying the riverbank life along the Ganga. Arrive in NIM Beach. Brahmpuri to Nim Beach 12 Kms. 1 Night Beach/Jungle Camp Stay, All 3 Meals, Evening Snacks, River Rafting, Jungle Trek, Camp Site Games. 1 Night Beach Camp Stay, All 3 Meals, Evening Snacks, Water Fall Trekking, Campfire, Beach Volleyball, Cricket, Body Surfing, Cliff Jumping, River Rafting. 02 Nights Beach Camping, 02 Lunches, 02 Dinners, 02 Breakfasts, 02 Evening Snacks, Jungle Trekking, Rock Climbing, Rappelling, River Crossing, Brahm Bridge, Campfire, Beach Volleyball, Cricket, Body Surfing, Cliff Jumping, River Rafting. 2 Nights Beach Camp Stay, 34 Kms River Rafting in Grade 4 and 5 Rapids, Kayaking, Trekking, All 06 Meals, 2 Snacks, Daily Campfire, Beach Games, Body Surfing, Cliff Jump Many More. 12. Child below 10 years will not be permitted to do Rafting. Lifejacket : A lifejacket happens to be your lifeline during your rafting adventure. Dry Bags : These waterproof backpacks keep your clothes and other accessories wet-free.